Prior to picking this one up, I had heard from many different readers that this was an empowering, diverse book. I love books like these- books that make me feel a certain positive way. Upon finding it at my public library one day, I knew I had to take it home with me. I couldn’t miss a chance at reading Dumplin’! What I can say is that I totally agree with the majority of other reviewers about this book. It was definitely a strong, powerful novel, however it did have its fair share of flaws that I will cover later on. 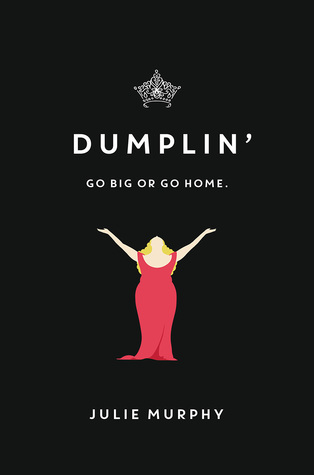 Dumplin’ basically follows protagonist Willowdean. She has always been a tad overweight, and she has had no problem with this. Upon meeting a gorgeous used-to-be jock named Bo at her new fast food job, though, she finds herself doubting her weight. Although she has never imagined entering her city’s beauty pageant that her mom runs, she does just that to regain her confidence. For the most part, I appreciate that Willowdean was confident and sure of herself, however as I explained, this self-confidence plummets throughout the book. Anyway, I am thankful that she was a loyal friend and that she embraced her flaws instead of covering them up. We don’t need any more characters who complain day in and day out- we need more like Willowdean who has an overall positive perspective on things! WARNING- this is not stated in the synopsis, but this book includes a *rather annoying* love triangle. The two love interests are named Bo and Mitch, and honestly, I preferred Mitch a smidgen more. Unfortunately, though, I read this book too long ago to completely remember why. I don’t have too much to say about the plot. It wasn’t slow-moving like a turtle, but at the same time it wasn’t as fast as a cheetah either. I guess it was just the perfect pace for me to be able to take in and appreciate all the events, you know? All in all, in spite of any and all flaws there were in Dumplin’, I found that it was a powerful, robust, coming-of-age novel. Willowdean was a great protagonist and I liked her a lot, the plot was paced beautifully, and I forgot to mention this before, but there were strong and incredibly sweet family ties. The love triangle may be annoying, but I will cajole you to devour this story for all the other reasons. Some days the damn dress just won’t zip.